Lewis Bruce bowled 29 overs. Cambridgeshire were narrowly beaten by Northumberland in their final Unicorns Championship match of the season in Jesmond today (August 16). 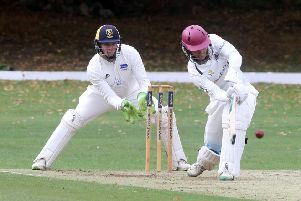 They lost by two wickets to the Eastern Division champions after setting them a victory target of 280. Cambs resumed their second innings this morning at 239-9 with Peterborough Town paceman Joe Dawborn unbeaten on 60. He added nine more to his total and Cambs were all out for 248. Northumberland lost their first four wickets cheaply - Sam Rippington took two of them and there was one apiece for Dawborn and skipper Lewis Bruce. But home professional Jacques Du Toit, top scorer in the first innings with 61, once again excelled with a superb innings of 85. He received good support from Steve Tindale (54no) as Northumberland reached their target after 76 overs. Dawborn was the most successful Cambs bowler with 4-53 while Bruce finished with 2-97 off a marathon 29-over stint and Rippington claimed 2-79 off 19 overs.